For the Taiwan-based company which may also be abbreviated as 中油 in Chinese historically, see Chinese Petroleum Corporation. PetroChina Company Limited (simplified Chinese: 中国石油天然气股份有限公司; traditional Chinese: 中國石油天然氣股份有限公司; Uyghur: چوڭگو نېفتى‎) is a Chinese oil and gas company and is the listed arm of state-owned China National Petroleum Corporation (CNPC), headquartered in Dongcheng District, Beijing. It is China's second biggest oil producer. Traded in Hong Kong and New York, the mainland enterprise announced its plans to issue stock in Shanghai in November 2007, and subsequently entered the constituent of SSE 50 Index. PetroChina was established as a joint stock company with limited liabilities under the Company Law of the People's Republic of China (the PRC) on November 5, 1999, as part of the restructuring of CNPC. In the restructuring, CNPC injected into PetroChina most of the assets and liabilities of CNPC relating to its exploration and production, refining and marketing, chemicals and natural gas businesses. Although PetroChina is the most profitable[according to whom?] company in Asia, this success may be the result of corporate management,[according to whom?] but can also be attributed to the near duopoly[not in citation given] on the wholesale and retail business of oil products it shares with Sinopec in China. Because of Sinopec's link to Sudan through parent company China Petrochemical Corporation, several institutional investors such as Harvard and Yale decided, in 2005, to divest from Sinopec. Sudan divestment efforts have continued to be concentrated on PetroChina since then. Fidelity Investments, after pressure from activist groups, also announced in a filing in the US that it had sold 91 per cent of its American Depositary Receipts in PetroChina in the first quarter of 2007. At the beginning of May 2007, the company announced it had made China's largest oil find in a decade off the country's northeast coast, in an oilfield named Jidong Nanpu oil field in Bohai Bay. In May 2008 these expectations were lowered. On November 7, 2007, Hang Seng Indexes Company announced that PetroChina would be a Hang Seng Index Constituent Stock, effective December 10, 2007. PetroChina has also come under scrutiny from international organizations for its part in trading with the Sudanese government who continues the ongoing war in Darfur. On August 19, 2009, PetroChina signed an A$50 billion deal with ExxonMobil to purchase liquefied natural gas from the Gorgon field in Western Australia, considered the largest contract ever signed between China and Australia, which ensures China a steady supply of LNG fuel for 20 years, and also forms as China's largest supply of relatively "clean energy". This deal has been formally secured, despite relations between Australia and China being at their lowest point in years, following the Rio Tinto espionage case and the granting of visas to Rebiya Kadeer to visit Australia. PetroChina's Dushanzi District refinery became fully operational on September 24, 2009. The refinery is China's largest refinery with annual capacity of 10 million tons of oil and 1 million tons of ethylene. The refinery is an integral part of China's ambitions to import oil from Kazakhstan. February 2011: PetroChina agreed to pay $5.4 billion for a 49% stake in Canada's Duvernay shale assets owned by Encana. It is the China's biggest investment in shale gas to date. PetroChina's subsidiary in Canada is named PetroChina Canada and has an office in the 707 Fifth Tower at 707 5th Street SW in Calgary. It operates under the direction of Li Zhiming as PetroChina Canada. China signed a deal in 2016 with the Nepal Oil Corporation to sell 30% of the total Nepalese petroleum consumption. China plans to build a pipeline to Nepal's Panchkhal along with a storage depot. In 2017, the shares of PetroChina upped after the rise of natural gas prices for commercial use. PetroChina is promoting safety, environmental protection and people-orientation as its slogan and is determined to encourage efficiency in utilization of resource as well as effective operation of the Health, Safety and Environment (HSE) management system as a method to reduce emission of pollutants. Petrochina had a chemical spill in November, 2005. One of its chemical plants exploded in Jilin, China, resulting in 100 tons of benzene, which is a carcinogen and toxic, pouring into the Songhua River. There was a slick of chemicals that spanned 80 kilometres. Harbin, which is another city along the Songhua River, had to cut the water supply from almost 4 million people, for 5 days. More than 60 people were injured, five died, and one person was missing due to the incident. The spill prompted China’s environmental agency to fine the company one million yuan (approximately $125,000, £64,000) for its pollution, which was the maximum fine that can be handed out in China for breaking an environmental law. However, this disaster sparked controversy about this law. People claimed the law was too soft. The spill even crept into Khabarovsk, Russia, where residents stocked up on bottled water. The city tried filtering its water of toxic substances, but officials were still unsure if the water was 100% safe for drinking. The Chinese government said it will take more than one billion dollars to clean up the aftermath. Li Zhaoxing, Chinese Foreign Minister at the time, issued a public apology to Russia due to the incident. Another major controversial issue is PetroChina’s development in gas reserves in Tarim Basins, Xinjiang. It is argued that such a project might pose a threat to the environment, as the construction of the pipeline might affect the wildlife in the regions where it runs through. However, no known environmental or social impact assessments have been conducted, as the environmental record of Tarim Basins is very poor. Approved in 2007, a $5.5 billion petrochemical plant, expected to produce 800,000 tons of ethylene and refine 10 million tons of crude oil a year, is now under construction by PetroChina in Chengdu, provincial capital of Sichuan in Southwestern China. Ethylene is widely used in the production of goods such as packaging and trash liners. Although the project claimed that $565 million of the total investment would be dedicated to environmental protection, residents of Chengdu who believe it might bring pollution to the local area took to the streets on May 3 and 4, 2008, to protest against the project. The whole demonstration was peaceful, and presence of Chinese government intervention was scarce. PetroChina was ranked 30th in 2018 Forbes Global 2000, a list of top listed companies of the world. PetroChina, on October 24, 2008 issued a series of medium-term corporate bonds worth 80 billion yuan ($11.7 billion), which was the biggest ever domestic issue by a listed company. The logo of PetroChina has represented the company in plenary capacity since 2004. The logo's basic, abecedarian design consists of a rising sun, projected onto a petal-based graphic. The colors utilized in the graphic are red and yellow, auspicious in Chinese culture. 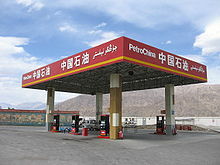 Beneath the English-language version of the design is positioned the company's name in an emboldened, black typeset, "PetroChina" (Chinese: 中国石油; pinyin: Zhōngguó shíyóu). PetroChina's current logo was adopted 26 December 2004. The contour of the logo is defined as a "petal graphic equally divided by ten in red and yellow colors", which, according to description, "are the basic colors of the national flag of the People's Republic of China, and which embody the characteristics of the oil and gas industry." The essentially spherical design of the logo, meant to exemplify PetroChina's global development stratagem. The ten equanimous petals are indicative of PetroChina's ten consolidated core businesses. The red substratum is intended to highlight "an angle of a square shape, not only demonstrating PetroChina's strong fundamentals, but also implicating the company's huge power of cohesion and creativity." The general floral connotations of the logo are designed to capture PetroChina's "social responsibility of creating harmony between energy and environment." Finally, the sun ascending over the horizon in the center of the logo epitomizes the prosperous future hoped to lie within the future of PetroChina. ^ "Executive Profiles". Petrochina.com.cn. Retrieved 29 January 2018. ^ a b c d e f "Annual Report 2017" (PDF). PetroChina Company Limited, March 22, 2018. Retrieved May 29, 2018. ^ "Contact Us." PetroChina. Retrieved on July 8, 2010. "Address: 9 Dongzhimen North Street, Dongcheng District, Beijing, P.R.China." ^ Response to Berkshire Hathaway's statement on its holdings in PetroChina Company Limited Archived 2008-06-25 at the Wayback Machine, Sudan Divestment Task Force, 2007-02-23. Retrieved on 2007-03-28. ^ "Darfur activists claim Fidelity success". Financial Times. ^ "China claims major oil field find". BBC News. May 4, 2007. Retrieved May 22, 2010. ^ "China: PetroChina's Jidong Nanpu oil field smaller than originally thought". Energy-pedia.com. Retrieved 29 January 2018. ^ "Subscribe to read". Financial Times. Retrieved 29 January 2018. ^ "Executive Team - Brion Energy". Brionenergy.com. Retrieved 15 May 2017. ^ "PetroChina to increase investment in oil, gas business despite financial crisis_English_Xinhua". 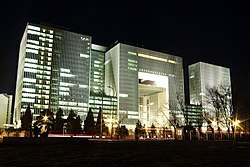 News.xinhuanet.com. Retrieved 15 May 2017. ^ "PetroChina's shares fuelled by increase in natural gas prices". South China Morning Post. Retrieved 2017-11-14. ^ a b "Maximum fine over China pollution". BBC News. January 25, 2007. Retrieved May 22, 2010. ^ "The Epoch Times - Jilin PetroChina Explosion Under Investigation, Vice-Mayor of Jilin City Reported Dead". En.epochtimes.com. Retrieved 15 May 2017. ^ "Maximum fine over China pollution". BBC News. January 25, 2007. Retrieved 2013-05-14. ^ "PetroChina branch fined for pollution". Chinadaily.com.cn. Retrieved 15 May 2017. ^ "Toxic leak reaches Russian city". BBC News. December 22, 2005. Retrieved May 22, 2010. ^ Bezlova, Antoaneta (December 2, 2005). "China's toxic spillover". Asia Times. Retrieved 2013-05-14. ^ He Huifeng (January 11, 2015). "Chinese city lashes PetroChina unit over chemical leaks". South China Morning Post. Retrieved 2015-02-10. ^ "BP Amoco - Divest From PetroChina (2000 - 2001) - Trillium Asset Management". Trilliuminvest.com. Retrieved 29 January 2018. ^ Wong, Edward (May 6, 2008). "In China City, Protesters See Pollution Risk of New Plant". The New York Times. Retrieved 2013-05-14. ^ "The World's Largest Public Companies List". Forbes. June 2018. Retrieved 29 October 2018. ^ "PetroChina launches new logo". PetroChina. Retrieved 29 July 2013. McGregor, Richard. The Party: The Secret World of China's Communist Rulers. Harper Perennial: New York, 2012. ISBN 978-0-06-170876-3. Originally published in 2010 by Allen Lane, a Penguin Books imprint.